Does the latest Star Wars: The Force Awakens TV spot give away a huge spoiler? The internet has worked out the entire plot of JJ Abrams movie based on piecing together elements of the various trailers so far. Or has it? The double bluff, or phantom twist, seems to have become a thing in 21st-century big-budget film-making. First there was Benedict Cumberbatch in Star Trek Into Darkness, who, everyone involved in the film insisted, couldnt possibly be Khan Noonien Singh from 1982s Star Trek II: The Wrath of Khan until it turned out he was. And more recently we had Christoph Waltz as Ernst Stavro Blofeld in Spectre, a secret so poorly kept that it was cheerfully revealed by the BBC1s The One Show a week before any members of the public had seen the movie. Given that JJ Abrams himself was responsible for the whole Khan fandango, we should probably take the cryptic clues presented in trailers for Star Wars: The Force Awakens about the familial links between characters new and old pretty seriously. They might well be sleight-of-hand, mere marketing curveballs to help save us from spoiler hell. But on the face of it probably not. The movies new US TV spot presents the most credible evidence yet that Daisy Ridleys Rey is the offspring of Han Solo and Princess Leia Organa. I have lived long enough to see the same eyes in different people, says Lupita Nyongos piratey alien Maz Kanata in voiceover, as the camera flits from Ridley to Harrison Fords Solo. I see your eyes. I know your eyes, she says as the camera shoots back to Ridley. Finally, up pops the line: Every generation needs a story just in case anyone anywhere missed the point being made. According to Entertainment Weekly, who got it first-hand from Abrams and his team, Kanata knows what shes on about when it comes to eyes. Her own peepers apparently hold some secret power which explains why theyre covered by goggles in the only image of the character seen so far. Let us not forget the other clues weve previously been given that The Force Awakens will continue the story of Anakin Skywalkers descendants. The Force is strong in my family, we heard Mark Hamills Luke Skywalker telling an unknown figure in Aprils second teaser. My father has it. I have it. My sister has it. You have that power too. Then there are Ridleys comments in last weeks Japanese trailer for Abrams movie: I know all about waiting for my family, she reveals. Given that all the evidence so far points to Rey having grown up as a scavenger on the far-flung desert planet of Jakku (just as Luke and Anakin also spent their youths in dusty backwaters), we can assume shes not just complaining about Han and Leias famously poor timekeeping. The young woman has clearly been hidden away for her own safekeeping, just as Luke and Leia once were. Might the family connection go even further? Lucasfilm president Kathleen Kennedy has hinted that the Skywalker line continues to have a propensity for twins, and we still dont know Kylo Rens real name Abrams has said the moniker was given to him by the Ren order of knights. Theres a lot of internet buzz right now about the theory that Adam Drivers Vader-worshipping fanboy and Rey are siblings, separated at birth, with one choosing the dark side, the other the light. Suddenly Ren telling Darth Vaders ruined helmet: I will fulfil our destiny in the Japanese trailer makes a whole lot more sense. 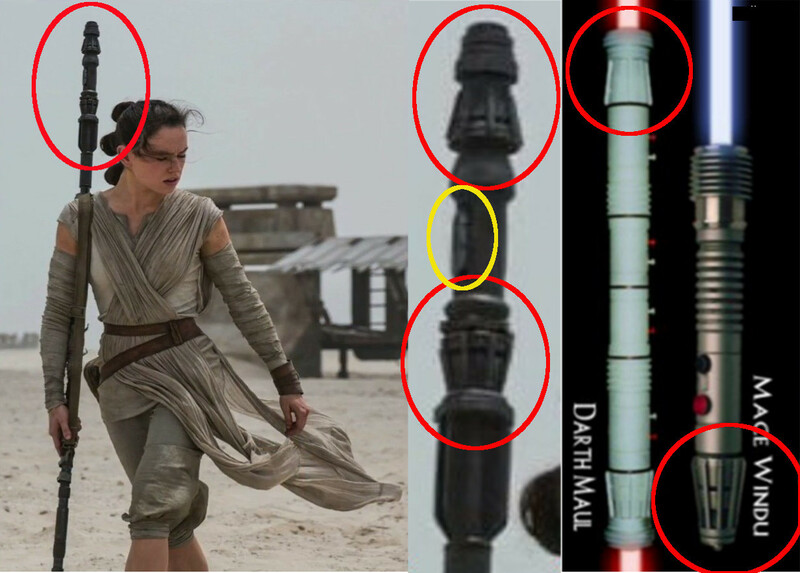 This would also explain the positioning of the pair on the main poster for The Force Awakens, as the main figures presented with Reys staff and Rens lightsaber in alignment. And whos to say that staff is everything it appears to be? Perhaps the two ends come away to reveal a Darth Maul-style double-ended lazer sword! OK, Im not sure I believe that later suggestion, if only because the marketing people at Disney would surely already have a natty toy version in stores to meet festive demand. But Im just telling you whats out there on the internet, people. Speaking of which, Entertainment Weekly seems to think Rey might be a descendant of old Obi-Wan Kenobi, rather than a Solo-Organa sprog. No reason is given, and Jedi Knights arent supposed to father children, but it would at least be a decent last-minute plot twist. Not that were likely to get one, on recent evidence. Still want more Star Wars gossip? ScreenCrush has compiled this excellent guide to some of the supporting space weirdos who will soon be seen in The Force Awakens, including that strange camel-like creature from Abrams Force for Change video last year.